Silk clothing may be labled "dry-clean only," but it can often be washed using special techniques. Silk apparel and home goods may offer an extra feeling of luxury, but that also means you need to exercise an extra level of care on laundry day. Some silks are not colorfast, so even blotting a stain could cause discoloration. A test for colorfastness can help you determine whether your favorite silk goods should be washed by hand, in a machine, or left to a professional dry cleaner. 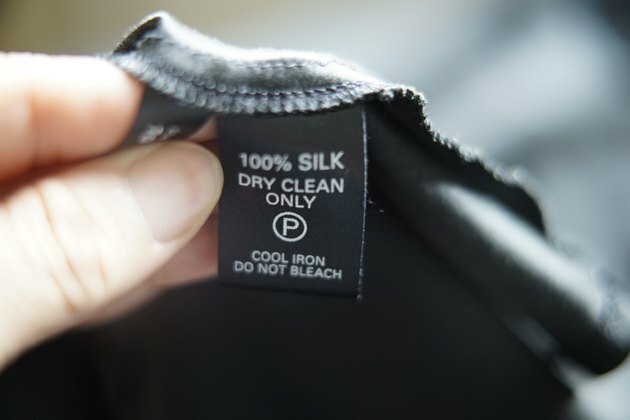 Before attempting to wash that silk by hand or in a machine, read the care tag. Some items recommend dry cleaning or hand washing, while others specifically say "dry clean only." More durable silks, such as some sheets, can even be washed by machine, using a cycle for delicates. 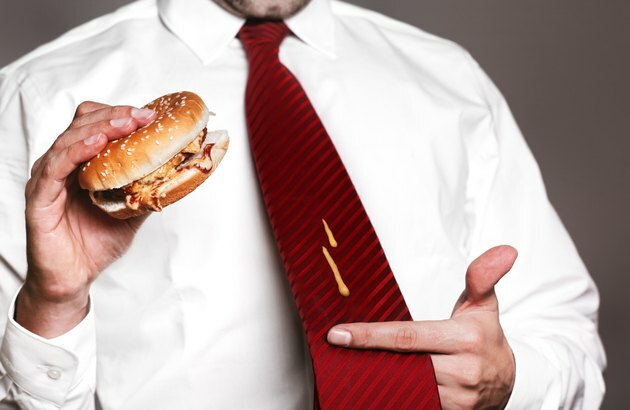 Food stains should never be rubbed . It may seem instinctive to immediately rub a spill or stain on that silk tie with a damp cloth, but this could actually harm the silk, permanently discoloring the item by removing some of its pigment. It could also damage the silk fibers. Instead, dab that spot with a dry, lint-free, white cloth as soon as possible. A small amount of water can be used to help dilute a spill such as coffee, as long as the silk pigment doesn't bleed when wet. To test for colorfastness, dab an inconspicuous area with a small amount of water on a white cloth, pressing the cloth against the silk. If color transfers onto the white cloth, the silk is not colorfast. To make your own spot remover, mix 1 tablespoon each of white vinegar and lukewarm water. If dealing with dried food or similar matter, scrape as much residue off the silk as possible with the bowl of a plastic spoon. Test the silk for colorfastness before treating the stain. Once you're sure the silk pigments won't bleed, dab— don't rub—the spot with the dilute vinegar solution using a lint-free white cloth. Blot the area with a dry portion of the white cloth. Repeat the process until the stain vanishes. If the silk isn't colorfast, don't treat the spot, as you'll create a permanent discoloration. Instead, take the item to a dry cleaner. Color-fast silk can usually be washed by hand. Silk that is color-fast and has no prohibitions against washing can effectively be washed by hand. Fill a small washtub with cool water, along with a small amount of laundry detergent designed specifically for delicates and silks. 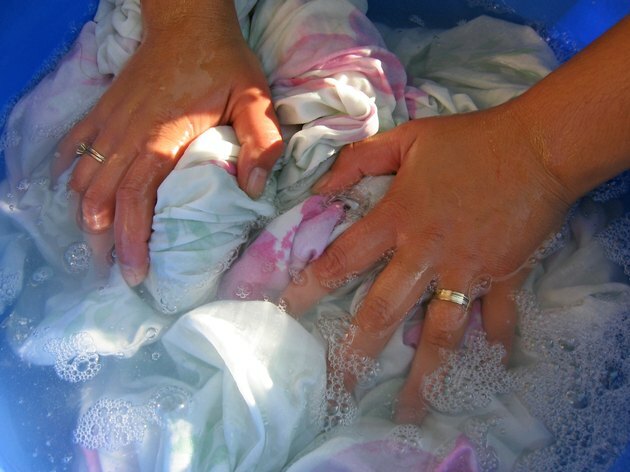 Swish the water around by hand to mix in the detergent, then soak the silk item for five minutes. Remove the silk, empty the water and refill the washtub with cool water. Soak the silk again for one minute or so, then rinse it under cool water in the sink. Squeeze the silk without wrinkling it, then set it on a white towel. Fold the towel over the silk, then press out as much water as possible. Air-dry the silk, either on a clothesline or by lying flat as recommended on the care tag. Do not hang the silk in direct sunlight or it will most likely fade. If your silk sheets are designed for washing in a machine, they're still not as durable as cotton or blended sheets and must be treated with care. The same holds true for other machine-washable silk. Place the sheet or other silk item inside a white pillowcase and tie the case shut with a piece of white twine. If you have a mesh bag designed for washing delicates, use that instead of the pillowcase. Do not use any laundry products containing enzymes, chlorine bleach or fabric brighteners, as these can discolor the silk.